Elementary children between the ages of 6 and 12 (1st – 6th grades) have an abundance of energy and flourishing imaginations! It is an explosive period of social and intellectual growth that, in the right environment, leads to enlightened scholarship and responsible leadership. 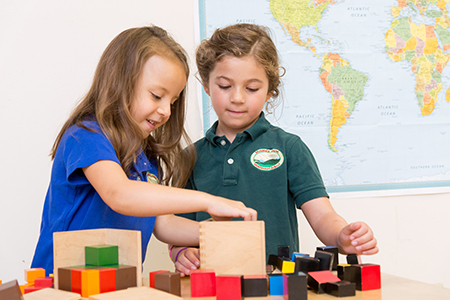 The Montessori elementary curriculum takes an integrated, interdisciplinary approach to enable children to make sense of their world. The elementary child’s question, “I wonder why …” is answered by interactive lessons in botany, zoology, physics, mathematics, language, history, and geography. Incorporation of various art techniques in students’ academic work integrates artistic expression with science and the humanities. 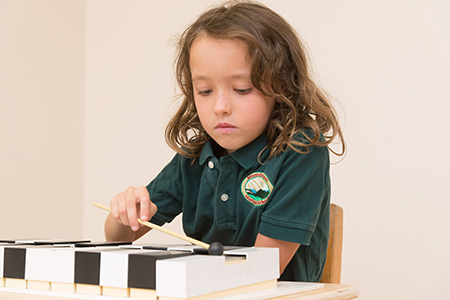 Music can be heard throughout the morning as small groups of children sing and play songs and learn notation with specialized Montessori music materials, as well as recorders and keyboard instruments. Physical education is enjoyed daily on the 5-acre wooded campus, including a ¼-mile running trail. 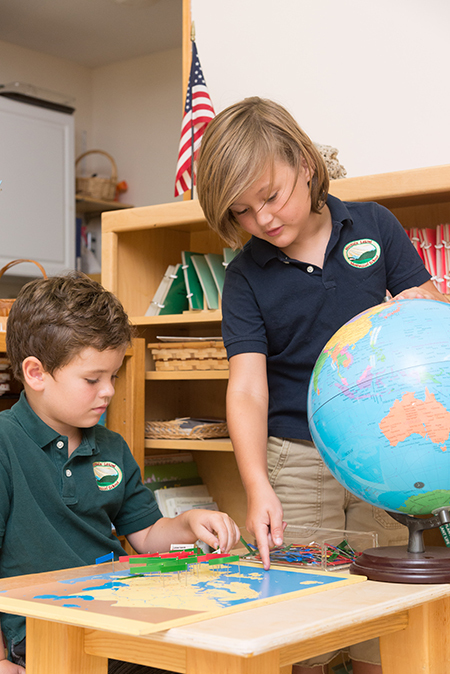 Because of the elementary child’s voracious appetite for knowledge, the Montessori curriculum encompasses countless lessons that explain the workings of our universe, the organization and diversity of life on Earth, and the study and appreciation of all cultures since the beginning of Man. At the start of each school year, “Great Stories” are told that provide a curriculum framework and stimulate the children’s research, experimentation, and enthusiasm for learning. Individualized and small group lessons, along with class discussions enable each child to learn at his or her own pace. Long, uninterrupted work periods allow scholars time to thoroughly research an area of interest. The multi-age grouping provides younger children with mentors and older children with opportunities to be compassionate leaders. This is a learning community that supports and appreciates each child’s abilities and contributions. Small group projects and reports are enhanced by research trips to museums or visits to a professional in a given field of study. There is a commitment by the students to share what they have learned, and their presentations often stimulate new interests. Acquisition of knowledge is its own reward, so Montessori students tend to be self-disciplined and intrinsically motivated in their work. Self-responsibility is fostered through maintaining student work journals. Students meet regularly with the teacher who monitors each child’s progress and schedule. Through careful observation, teachers know the proper time to introduce each new lesson and to supplement and reinforce learning concepts to ensure mastery of skills and concepts. Every year, Mountain Laurel is proud to offer the exceptional opportunity to send our sixth students to participate in the Montessori Model United Nations Conference in New York City. With this incredible experience, our students harness the multiple skills and discipline they have learned in preceding years, culminating in a globally oriented humanitarian problem solving effort that sharpens their skills in academics, leadership, and community service. They become true citizens of the world. This work involves extensive research, analysis of cultural and global issues, public speaking, informed debate, and realistic problem solving for real world problems. In the past, our students have chosen to represent the interests of Kenya, North Korea, and Pakistan. The project becomes a spring-board for academic skills and success to which they will have access throughout their academic career. The Mountain Laurel Community is proud to support this once-in-a-life-time experience for our students.